You might have MS, but your condition does not control your life or how you live it. Show everyone in your life how strong you are in the face of adversity by wearing this MS awareness hoodie. You'll be educating others about the realities of living with MS day after day. 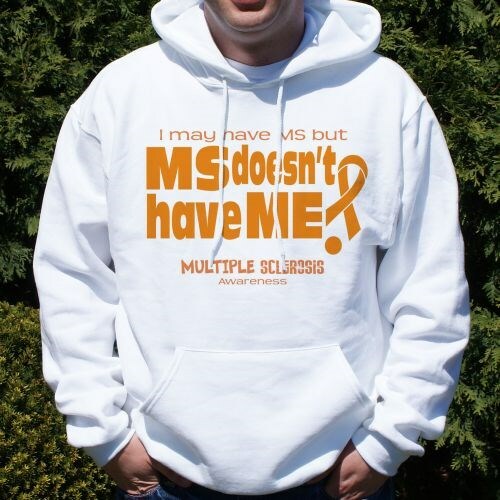 This MS Awareness design is printed on our 50/50 cotton/poly blend hooded sweatshirts, machine washable in youth sizes S-L and adult sizes S-2XL. Our hoodies can also be good MS awareness gifts for anyone who has just been diagnosed. Printing was poor quality. I am sad that I have to give my daughter a shirt that looks so bad for Christmas! Additional Info Shop our MS awareness apparel to find something for you and your walk team to wear at your MS awareness event. This hoodie will spread a message of strength and overcoming obstacles to all who live with MS. Our MS Doesn't Have Me Awareness Long Sleeve Shirt is another popular design.